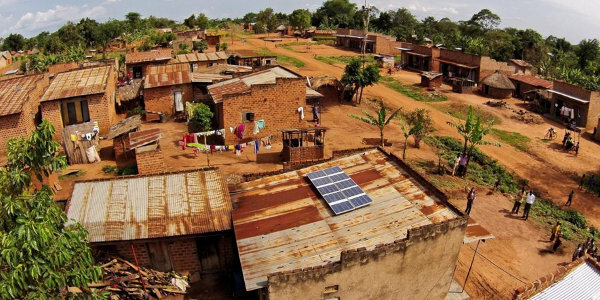 Uganda-based SolarNow sells solar energy systems to rural households. This article was produced by Maritz Africa Intelligence specifically for the NTU-SBF Centre for African Studies, a trilateral platform for government, business and academia to promote knowledge and expertise on Africa, established by Nanyang Technological University and the Singapore Business Federation. The PDF can be downloaded here. There are various examples of companies doing thriving business in Africa’s rural areas. Through innovative sales, marketing and distribution tactics, they are overcoming common rural challenges such as under-developed infrastructure and low purchasing power. This report examines some of the strategies companies have employed to capture the opportunities in the continent’s hinterlands. In the mid-1990s, Kenya’s Equity Bank found itself in the unenviable position of being technically insolvent. However, over the following two decades, it transformed into a leading financial institution with over 10 million customers by predominantly targeting the low-income and marginalised mass market. It has also gone beyond the comfort of the cities to provide loans and banking services to those living in rural areas – a segment neglected by many of its competitors. But attracting and transacting rural customers through brick-and-mortar branches is expensive, given that people are dispersed across wide spaces. To overcome this challenge, Equity embraced a model called ‘agency banking’, which comprises partnering with existing retail outlets – usually informal kiosks – to offer selected products and services on behalf of the bank. Kenyans living in remote areas often have to travel long distances to visit a bank branch, but with the agency banking model, Equity brought financial services closer to where people live. Today the group has over 27,000 agents, compared to not more than 180 traditional branches. Equity is an exemplary case study of a company that has embraced the opportunities in rural Africa. Even though the continent is urbanising, it is estimated 60% of its billion-plus population still live in the countryside. Rural markets offer companies a first-mover advantage and the chance to build consumer loyalty due to the lower penetration of brands. For instance, Continental Beverage Company in Côte d’Ivoire – producer of the Olgane bottled-water brand – has found success by focusing on secondary towns and remote areas, where its competitors were less active. Likewise, Kenyan retailer Society Stores targets cash-heavy agricultural towns that have been overlooked by others. “The cost of labour is cheaper up-country than in Nairobi. The rent is less, and you still find people with disposable incomes,” said the company’s CEO, Trushar Khetia. Companies should, however, not lose sight of the many hurdles associated with operating in Africa’s remote areas, including weaker purchasing power, poor infrastructure and a geographically scattered population. Rural success, therefore, demands appropriate pricing, relevant products backed by clever marketing campaigns, optimal local procurement (where possible) and cost-efficient distribution strategies. The average income of rural consumers is estimated to be 49% less than that of their urban counterparts. For this reason, companies need to ensure their products and services are priced correctly. In addition to straightforward discounting, the affordability challenge can be addressed through smaller pack sizes and payment plans. Tampering with product quality should, however, be resisted as low-income earners can’t afford to purchase a solution that doesn’t fulfil its promise. In East Africa, consumer goods producer PZ Cussons makes its Venus brand of hair- and skincare products more affordable to rural customers through smaller pack sizes – its 50mℓ and 100mℓ units are top sellers. Similarly, in a bid to win over small-scale farmers, Germany’s Bayer has introduced agrochemicals in single-use units in countries such as Malawi, Zimbabwe and Zambia. For instance, it has launched a small 10mℓ pack of insecticide, costing less than US$1. It is just about the right quantity to mix with 15ℓ of water, the capacity of a knapsack sprayer typically used by smallholders. Companies are also making their products and services accessible through innovative financing arrangements and payment plans. Kenyan mobile telecommunications operator Safaricom highlights its Okoa Jahazi offering – through which customers can access airtime on credit and pay for it at a later date – as one such initiative. The service was recently revamped by enabling customers to settle their Okoa Jahazi balances in instalments, rather than a once-off payment. Affordability alone is often not enough to win in the hinterlands. It is just as essential for the overall value proposition, packaging, branding and marketing of a product or service to align with the realities of rural customers. An important consideration when doing business in the African countryside is illiteracy, which is estimated to be significantly higher in rural areas than in the cities. One entrepreneur who discovered this through experience is Alloysius Attah, founder of Farmerline, an information portal for smallholder farmers in sub-Saharan Africa. When starting the business he had a plan to build an SMS platform, but a few months into piloting the service, realised that many rural farmers were uneducated and struggled to understand the SMS content. “So we moved to voice messages. Now our application sends information to farmers in any language – such as Swahili or any of the local languages in Ghana,” he explained. Another practical implication is that illiterate rural shoppers often base their purchasing decisions on packaging visuals as opposed to the associated text. Brands, therefore, shouldn’t make extensive changes to their package design, as buyers might think it is a counterfeit product. Marketing methods and messages also need to resonate with the rural market. Some traditional media platforms, such as television, have low penetration in remote regions – which is why marketers should consider plugging into channels such as radio, outdoor media, point-of-sale branding, using opinion leaders in the community and local festivals. “Radio, electronic direct messaging via SMS, and outdoor/ambient media are the key channels we use to communicate to rural customers. We also rely on direct selling (below-the-line activations) to educate customers on new and existing products,” notes Steve Okeyo, director for sales and regional operations at Safaricom. To reach consumers living in remote areas, South African marketing agency, The Creative Counsel, has created the concept of zonal champions – local community members who are appointed to persuade their friends and family to try out new products. Given the limited entertainment options in rural regions, companies that make their communication entertaining are bound to have an impact. For instance, some years ago, Nokia successfully communicated its ‘one-year warranty’ in South Africa through a captivating radio drama. Rural customers are hard to reach due to poor transport infrastructure and the fact that they are dispersed over large areas. Retail outlets in the hinterlands are often informal, stocking relatively few brands under each product category. Traditional trade is also associated with long and complex supply chains. According to PwC, multinational consumer goods companies would typically sell their products to a distributor from where it changes hands to regional wholesalers, that in turn feed city or district-based semi-wholesalers, which then supply informal traders. A popular strategy is to involve local entrepreneurs or third parties in the last-mile distribution. One of the most well-known examples of this is Coca-Cola, which has thousands of micro distribution centres (MDCs) throughout the continent, typically in areas difficult for delivery trucks to reach. These MDCs are owned and run by local businesspeople, who employ locals to then sell and distribute Coca-Cola’s drinks to retailers, often by bicycle or pushcart. In addition to more efficient distribution, Coca-Cola’s MDCs and the fact that the company works with local bottlers, also improves the sustainability of its business. “We have operations in every single country on the continent, even [in] Somalia… People sometimes ask, ‘How does that work?’ It works because you understand that you can create a business opportunity, and people can see beyond the politics to engage around the business opportunities. And the other reason why it works is because you engage local investors in those businesses. Those are the fundamentals of a sustainable business,” said Bill Egbe, the former president of The Coca-Cola Company’s South African unit during a conference in 2010. “It doesn’t make sense to want to try and keep all of the gains for yourself. You have a much more viable business system when you have partners along the value chain who have a vested interest in the long-term survival of your business because they derive a living from your business system. That is the ultimate formula for sustainability on the continent,” he added. Likewise, pay-as-you-go home solar system provider M-Kopa Solar, relies on hundreds of direct sales representatives (DSRs) to sell its solar systems to customers in remote villages across East Africa. These DSRs collect the solar kits at M-Kopa retail outlets – which are scattered across major towns – and then take them deeper into the villages where the real market lies. M-Kopa’s DSRs are paid a commission on sales. Initially, M-Kopa used existing vendors and shops to sell its solar systems, but changed tack after realising this model was not conducive for rapid growth. Its network of DSRs has helped M-Kopa solve the common challenge of last-mile distribution to rural communities. “Having it sit in a store on a shelf was not as productive as getting the product into the market where people could see it, and touch it and feel it. Maybe at some point it becomes so popular that you can stock it on a shelf and people come in and ask for it. But right now we have to build the market for the first time. Unfortunately, it’s not a super simple product, or it’s not a product people have seen before, so it doesn’t just sit on shelves and sell that way,” said M-Kopa’s founder and CEO, Jesse Moore. Another strategy is to derive maximum value from existing infrastructure. Throughout Tanzania, trading and manufacturing company METL Group has retail outlets that double as buying centres from where it purchases produce from farmers. “Any farmer that walks into one of my outlets and wants to sell a commodity, whether it may be cashew nuts or maize, I will buy it… [and if] he wants to buy a bicycle, I manufacture bicycles. He wants to buy sugar? I sell sugar. So it is a one-stop shop,” explained Mohammed Dewji, METL Group CEO, at the 2014 Africa Global Business Forum in Dubai, adding it would be difficult for multinationals to copy this system. One of Safaricom’s challenges is to reach its customers living in areas with sparse population coverage. Its solution? The Mtaani caravan, a mobile promotional and customer care unit. “While we have invested in more than 45 shops and 60 care desks in a bid to bring services closer to our customers, we still felt that some customers were not well-served through these touch points. In response, we now have the Mtaani caravan which travels through the regions, bringing our services to customers in rural and peri-urban areas. We are continuously seeking new and innovative ways to get closer to our customers; we would like to meet them where they are,” explains Okeyo. The successes of Coca-Cola, Equity Bank and Safaricom highlight the need for companies to be innovative and think outside the box as they devise their rural strategies. They also need to ensure their products are relevant for consumers in these regions. Taking advantage of the business opportunities offered by Africa’s rural communities is a long-term, resource-intensive exercise requiring a highly-focused approach. But for those who can combine the right value proposition with an efficient go-to-market strategy, the rewards can be substantial.